Getting a beautifully wrapped Christmas present is a gift in itself! I love love love interesting paper and real ribbons and sweetly tied bows! I think it’s a very thoughtful gesture from the gift giver! 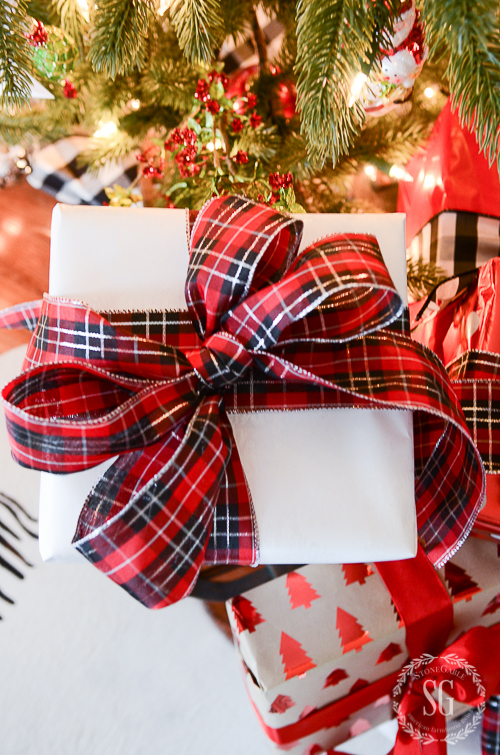 Isn’t it fun to untie a bow and unwrap a gift? It really adds to the suspense and lets us savor getting a gift a little longer! 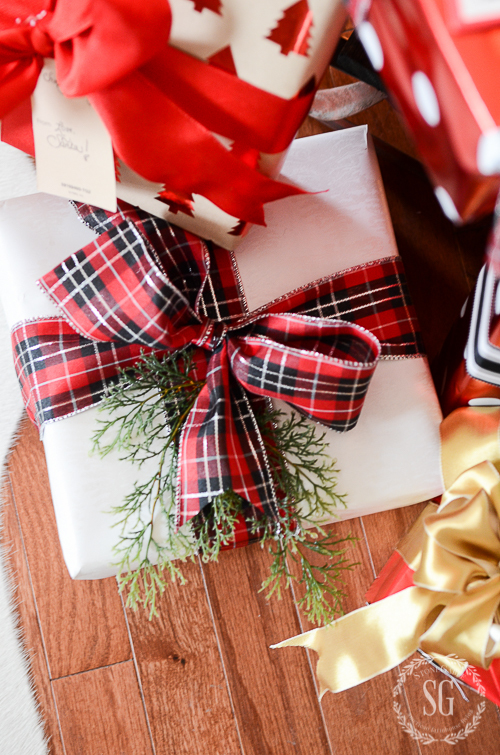 Wrapping a magazine worthy Christmas gift is so much easier than you might think! 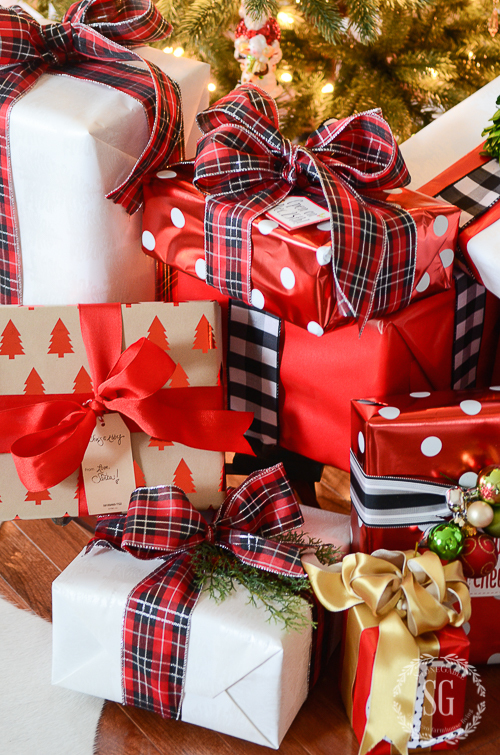 All you need is the right tools, a little time and these 10 best Christmas gift wrapping tips! 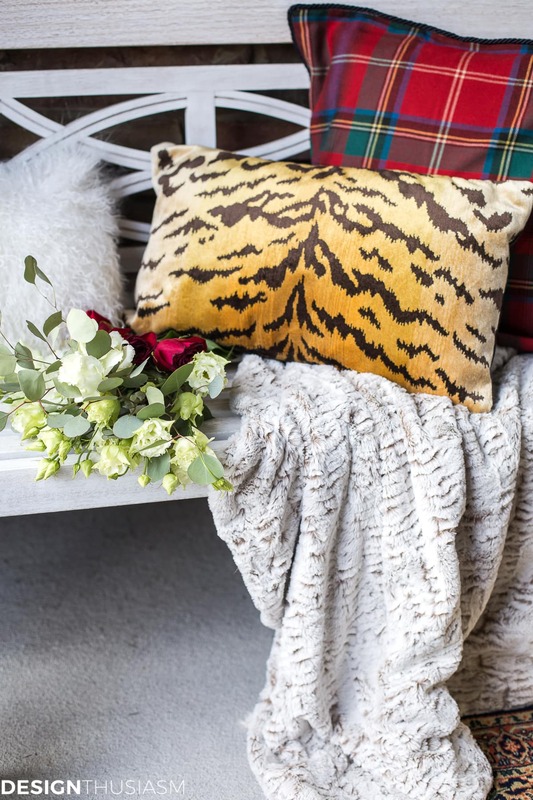 Today on Decorating Tips And Tricks we are spilling the beans on our very best GIFTS FOR THE HOME DECORATOR! Lots of great ideas and all the links to go with them!!!! 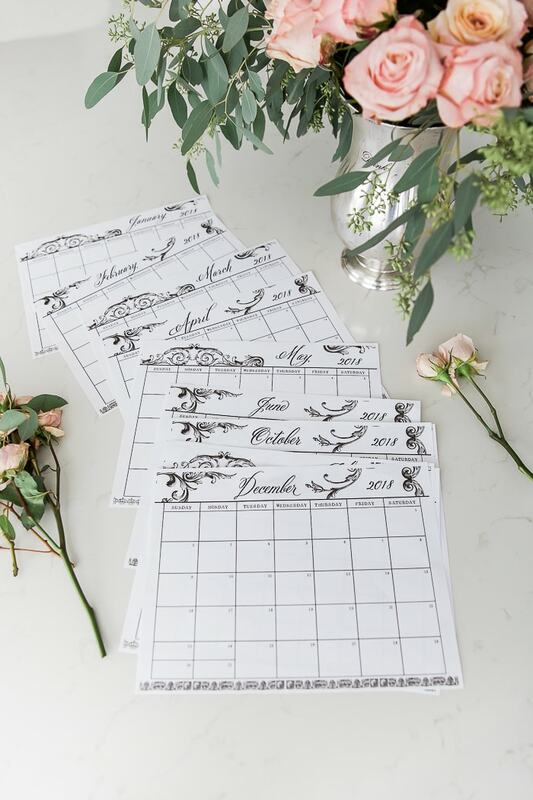 How about a trio of fabulous faux succulents or a monogrammed tape measurer or a set of really gorgeous small plates! LOTS of ideas! 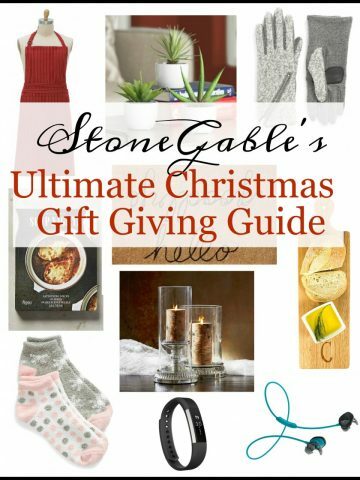 If you want to see the links to our great gift choices go HERE. And listen to every and all DTT episodes HERE. Today is HOME STYLE SATURDAY. 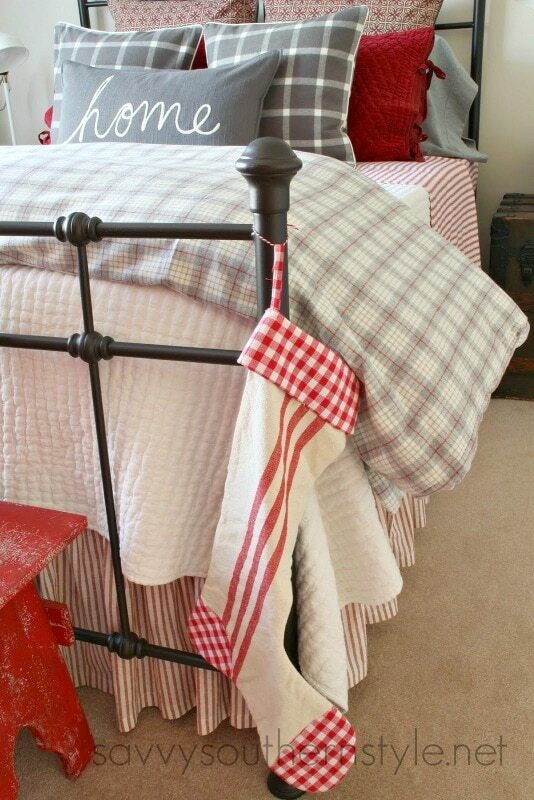 We scour our archives for our most popular post and spruce them up just for you! Make sure to check out my blogging friends at the end of this post! 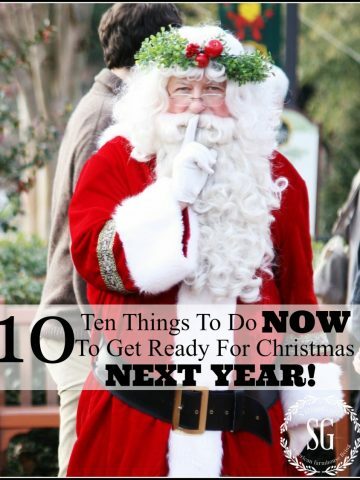 Let’s start our 10 tips countdown! I know there are so many “bag friends” out there. But if you want to wrap a pretty gift you might want to get rid of the gift bags. Yes, they are convenient and yes they come in many pretty colors, shapes, and motifs… BUT a wrapped box with incredible paper is so much nicer. It also costs less to wrap. So if you can, wrap your gifts. This is just my opinion. If you can’t give up gift bags make them super pretty with lovely tissue and bows and embellishments! Many people don’t like to wrap gifts and I think I might know one reason why! 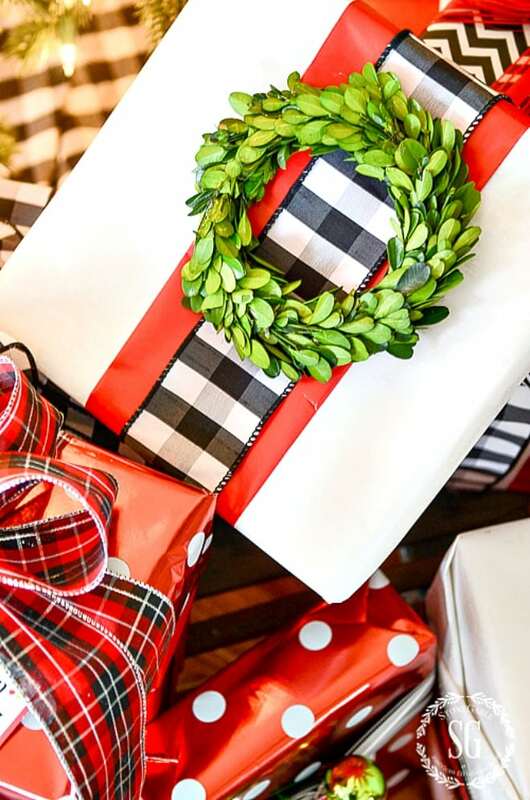 It’s so darn hard to wrap those odd shape gifts. Here’s a great solution… put everything in a box. I save boxes all year. Best boxes are sturdy and can be used year after year. They are strong and are rectangles. Rectangles are the easiest boxes to wrap! I can’t tell you how many years Christopher got a sweater in a Victoria’s Secret box! Those VS boxes are so sturdy! It’s sorta a fun part of our Christmas now. My family never knows what box they will find under all that glorious wrapping! We often all get a good laugh! But the gift was beautifully wrapped! I like to coordinate my wrapping paper with my tree decor. Oh, it looks so pretty! 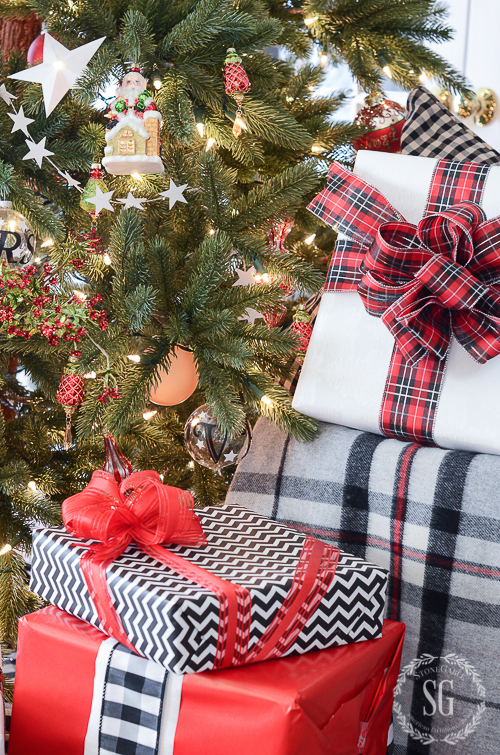 Try it one year and you’ll be coordinating the gifts under your tree every year! 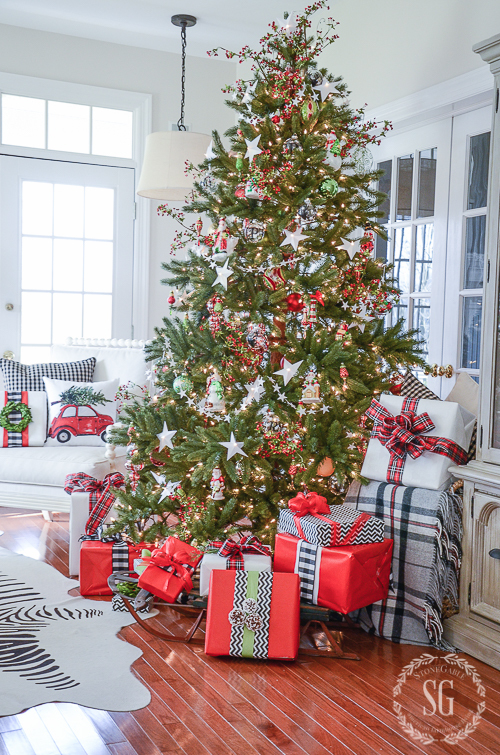 When my tree is decorated in neutrals, so are my gifts! This year my tree has lots of reds, greens, blacks and whites. So the gifts under the tree reflect those same colors! Lots of red! I love red! There are so many fabulous gifts wraps out there! 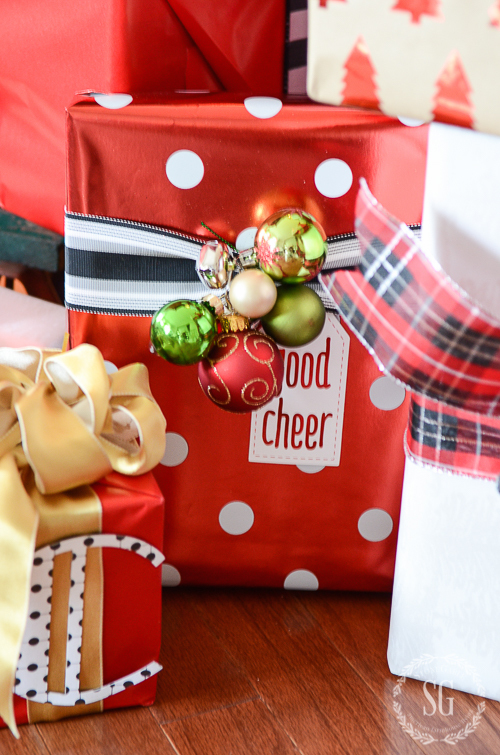 I like to choose a few gift wrap papers that look great together too! Shop for rolls of gift wrap with colors and design in mind! And take it a step further and coordinate your ribbon too! My favorite gift wrap is usually not one with a Christmas theme. 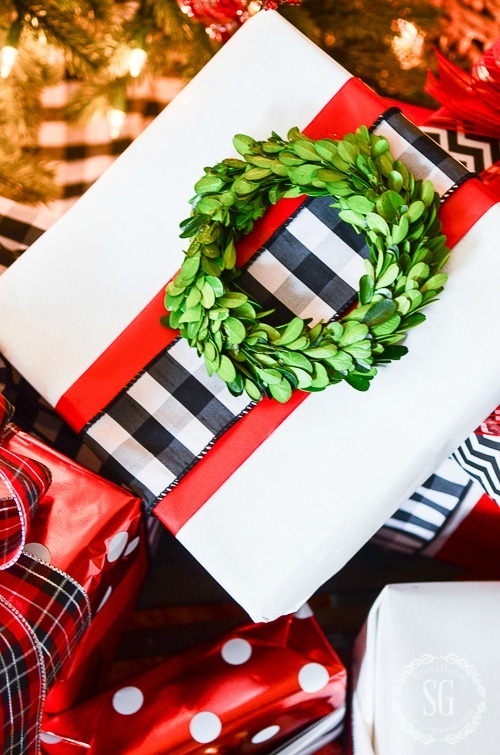 This year I chose a black and white chevron paper… oh, it’s so sassy. I’m adding a big red bow to give it a Christmas feel! Caution: Choose good quality paper. Many times they are no more expensive than poor quality wrap. This year I got red gift wrap that was horrible!!!!! It was thin and tore easily. Look at the red box in the image above. Do you see the side of the gift. What a mess! I ditched the paper and got another roll of good quality red. So much better and much less frustrating! 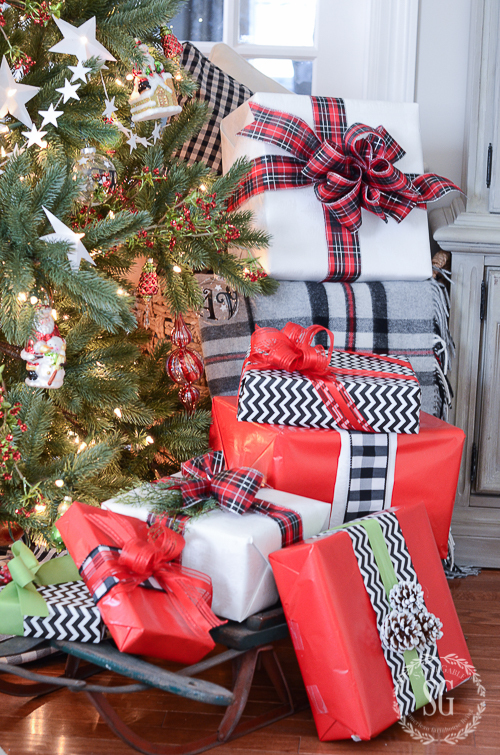 My favorite place to get gift wrap is Home Goods! Their gift wrap is amazing and cheap. A real winner! Great, real ribbon can be found online and in our local craft stores. And when they are on sale, they are a good buy. I use them and reuse them year after year! So, in the long run real ribbon is much more economical. I’ve trained everyone in our home to roll their ribbons up and put them in a bag after they open up a gift. My daughter Jacqueline is unofficially in charge of ribbon! Thanks, honey! Learn to make great bows! They are so easy… and once mastered take very little time to make. So much better than slapping on one of those self-stick bows that come in a bag! Give it a try. Even a neatly ties simple bow is a stunning way to embellish a gift! Learn how to make at least 3 bow styles! 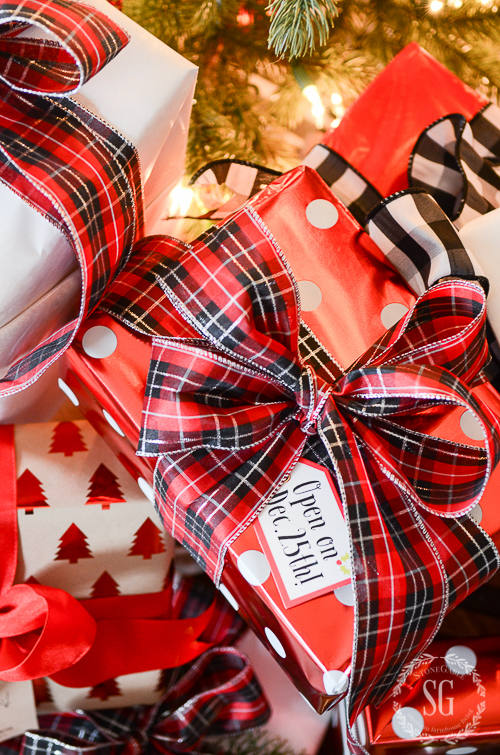 A pretty tied bow is perfect for a pretty Christmas package! This is exactly how I make my big bows. 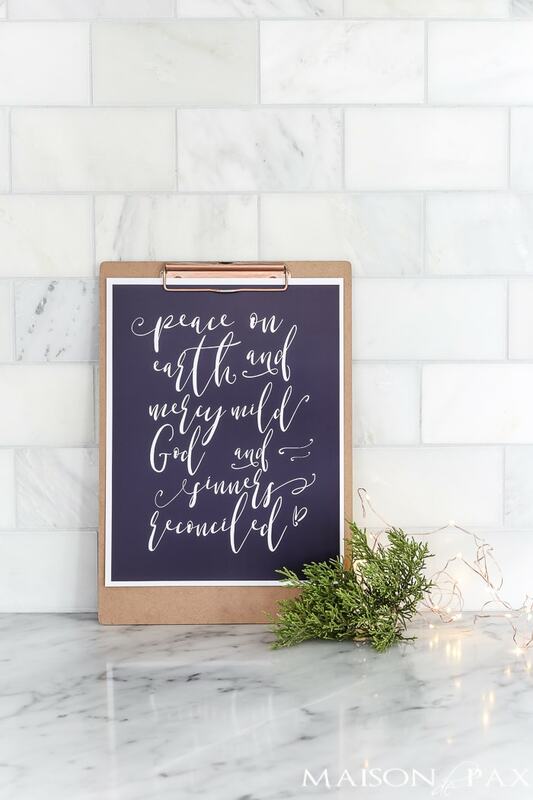 Bows are not the only thing you can use to make a Christmas present look gorgeous! How about using other Christmas inspired embellishments? 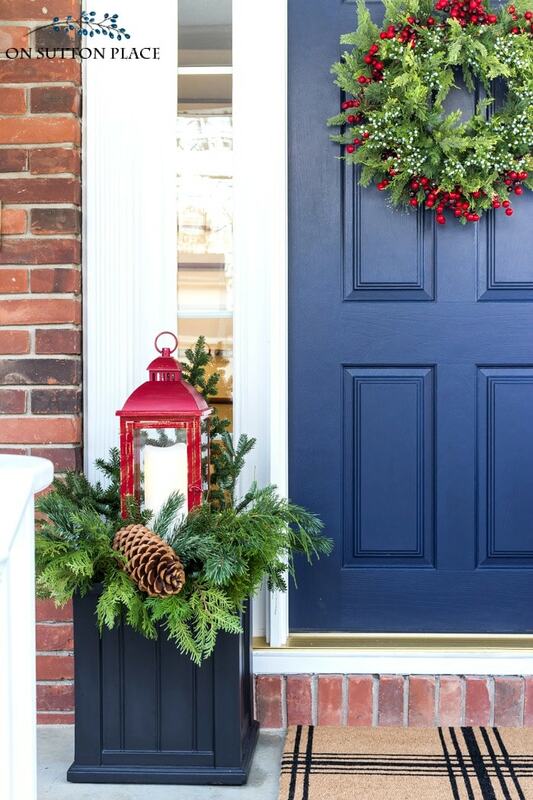 Try small wreaths, pinecones, ornaments, twine, greens and candy canes! How fun, right? I made this fun jumble of little ornaments and jingle bells by stringing them on a thin silver wire and then fixing it on to the black and white ribbon. 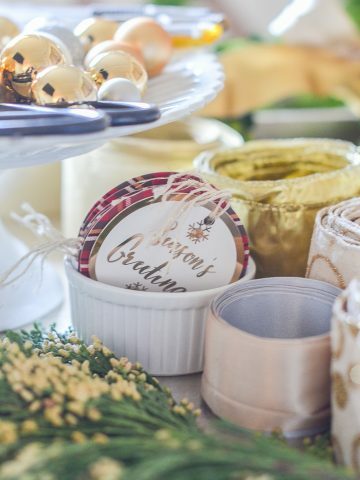 Keep accumulating real ribbon and non-perishable embellishments and use them from year to year. I find so many fun and different ways to use what I have in my ribbon stash! 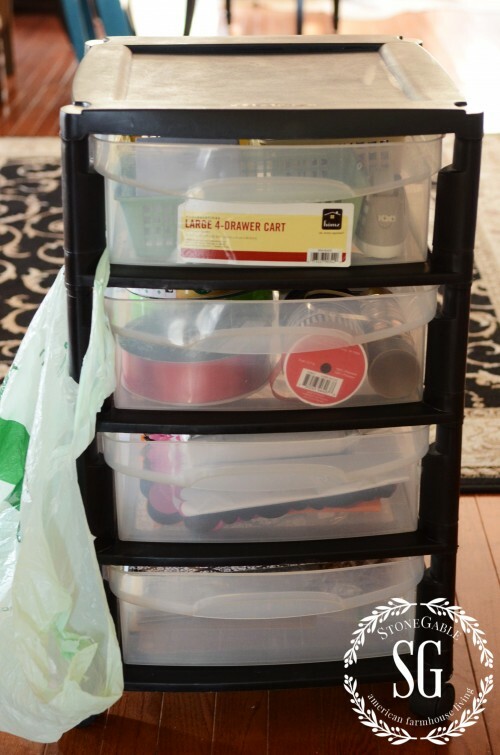 Keep everything in a large clear container. So easy to find and see what you have! If you wait to wrap your Christmas gifts at the last minute you won’t have the time, energy or desire to make them something special. Wrap as you buy! Or at least have a couple of gift wrapping days on your Christmas calendar. I’ve saved the best for last! I call this THE SECOND BEST CHRISTMAS TIP YOU WILL EVER GET! 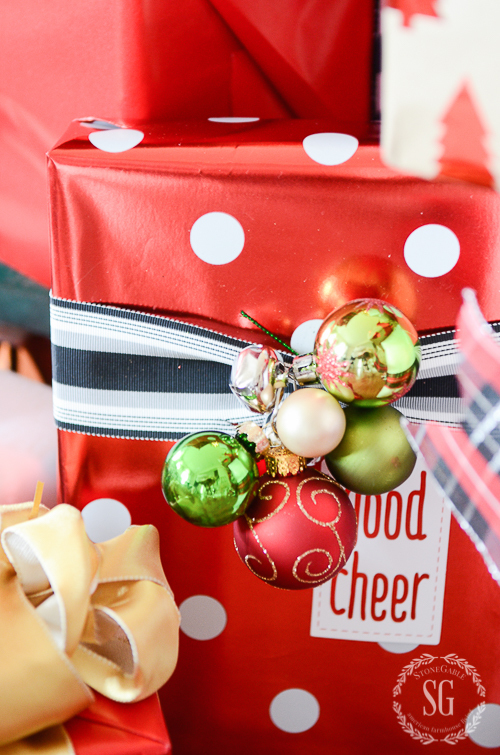 Create a GIFT WRAPPING STATION! It’s nothing fancy at all but it holds all the gift wrapping elements I need to wrap a beautiful gift! I have a table set up in our upstairs sitting room all Christmas season so I can wrap a gift or two when I get them or have a free minute. You can see how I created my gift wrapping station (and some pretty gift wraps from years past) HERE. You might want to follow me on Pinterest and see all the great things I find to pin daily HERE. Did you know that you can also follow me on Instagram? I just love the inspiration there! Go to Instagram and find me HERE. Let’s connect! Great tips Yvonne. 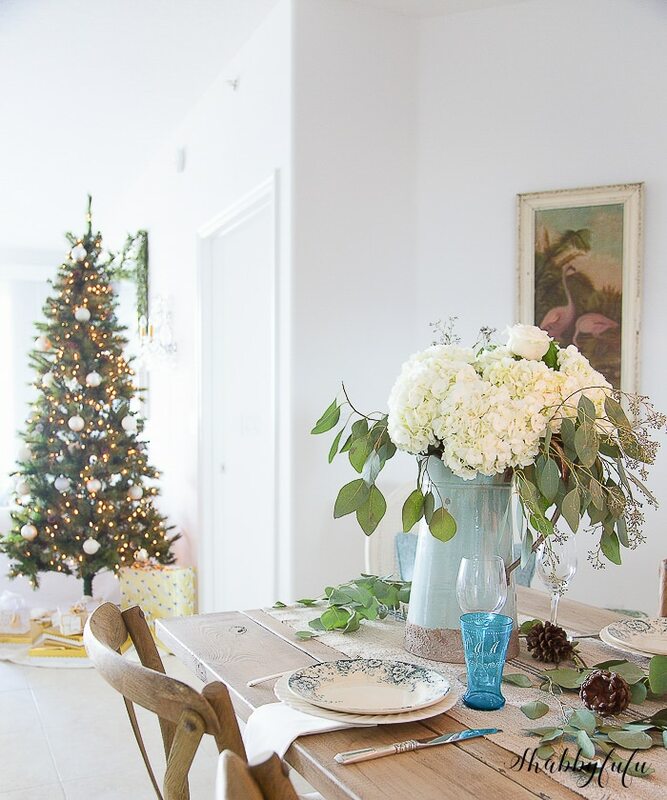 I love the idea of coordinating the wrapping with the tree. It looks so elegant. This year I have also embraced the neutal look for the wrapping paper and now I can use it all year long. So right Mary! I’m even thinking about having a “signature gift wrap” and using it for every occasion. Your packages are just gorgeous. I am a real sucker for beautiful wrapping paper. I love the look of solid paper embellished with strips of patterned paper and layered with ribbon. Thanks for the tips and inspiration. Pinned! Such a fun post Yvonne. i would love o have a gift wrapping party with you. Thanks for all the marvelous inspiration. I so agree a beautifully wrapped gift is a gift in itself. I love to have beautiful wrapped gifts! I used to gift wrap at a small store in my hometown in High school.. still love to wrap!!! Merry Christmas! Yep, my problem is that I try to wrap all the Christmas presents in one or two sittings. So I’m not in the mood to make them too pretty, just in a hurry to get them done! The packages under your tree look fabulous!!! Thanks for sharing all of your great tips. I have got to get away from using the gift bags. I like the bow making tips. Now I have a place where I can always look for instructions! You’re gifts look professionally wrapped ❤️? Always , love your ideas..I too save boxes and fAmily finally realizes don’t judge a gift by the box. Also save parts when I take apart old arrangements or have a swag or garland I can cut up and add to the ribbon. Usually use one color paper for each person…no nametags so no one knows which box to feel and shake. 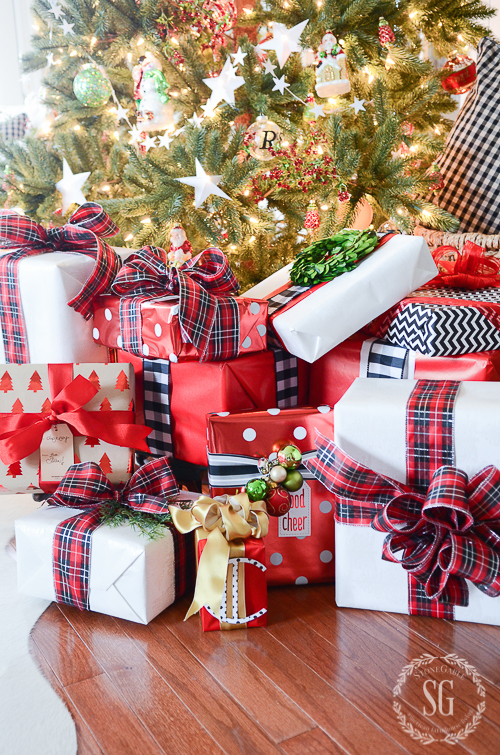 I love beautifully wrapped gifts and have always matched wrapping papers to the tree.I agree with wrap as you go so it’s not so overwhelming. Thank you for all the gift wrapping ideas, and the bow tutorials! My biggest blunder! Fabulous post!! I love a well wrapped gift! My Aunt Ginny was a master wrapper and my SIL Sharon makes beautiful bows. I try to carry on the tradition. My nieces know which presents are from me just by the wrapping! I use a different wrapping paper for each person instead of gift tags. It makes Christmas morning so easy. We also take turns opening gifts one at a time so we can see what everyone gets and to make it last longer. The little ones love to help everyone open their presents and creates a less “greedy” atmosphere. I hope you had a beautiful Thanksgiving, you give to us all so much in every post, like the current one, I am grateful Yvonne!! Gift Wrapping is major with me! I just love it and think the wrappings should look so inviting! I hand make my bows with a Bow Maker because some ribbons are so thick, the knot looks bulky, and because of that it can look floppy. Someday I hope there is a solution where I can keep the bow maker away and tie all the bows on myself. Thank~you Yvonne for another enjoyable post!! I so appreciate what you had to share today!! Over the years I have learned to take extra special care to Christmas gift wrapping….real ribbon but it has to be wired so I can make real bows; good paper… a place to wrap! 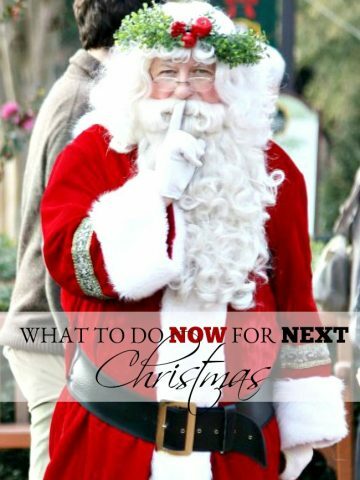 The only thing I haven’t done a lot of is embellishments…that will be the challenge this year!! Thank you so much for the tutorials … you are the best!! Have a great weekend!! Saturday after Thanksgiving and I am sitting here with my tablet and cup of coffee reading my favorite blog. Trying to get myself inspired to put away my fall decor and switch over to Christmas.We did hang some outside wreaths and checked the lights on my tree.Think I will start in the kitchen or maybe just get another cup of coffee. Oh well ,hope your Thanksgiving was wonderful and thankyou for all the great ideas you give me.Now if you could just stop by and get me off the couch!!! That may help you! Hugs! We call our wrapping station “gift wrap central”. I even made a little sign. 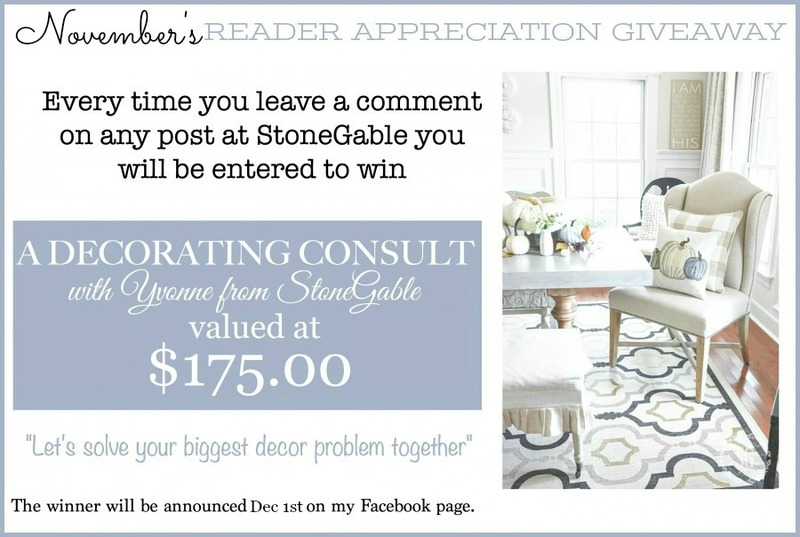 I always love to read your posts, Yvonne…it’s the best blog ever. Here’s my little holiday tip: when making poultry based gravy, add in some port wine! Use a tablespoon at a time until you like the taste. It is divine, subtle and adds complexity. Suggestion, take a ladleful of gravy, add a touch of port and taste it before you dump in an ingredient you (and your tablemates!) might not like!